16 September 2013-Peter Jenson Spanish football expert When Florentino Perez presented Gareth Bale to Real Madrid's supporters on Monday he would have had more than football on his mind. Questions about whether Carlo Ancelotti needs Bale in his team, whether he can be accommodated without causing squad upheaval that will disrupt Real Madrid's season, or whether he will be compatible with Cristiano Ronaldo, would have been put to one side. Bale might have been the Premier League's pin-up boy but he has already appeared - big grin, piercing blue eyes - on enough Marca front pages to last a season. Now he is officially a Madrid player, the launch of brand Bale can really begin in earnest. Madrid missed the opportunity to show him off to the world during Sunday's midday kick-off against Athletic Bilbao in what would have been prime time in Dubai, where shirt sponsors Emirates would have been watching closely. Instead, Emirates are now counting the days until January, when they hope Madrid will play a lucrative friendly in Dubai during La Liga's mid-winter break - with Bale as the main attraction. Earlier this summer former Real sporting director Arrigo Sacchi described Bale's transfer as "a commercial operation", adding: "I think Madrid, through their sponsors, have decided to buy a British player." Madrid certainly saw how Barcelona signed a new sponsorship deal with Panasonic just days after signing Brazilian star Neymar. The audiovisual giant was already one of the player's sponsors in Brazil and after he joined Barcelona, Panasonic became one of the club's multi-million-pound global partners. Bale will cede 50% of his image rights to Real Madrid and they hope his arrival will help increase the 512m euro income they registered at the end of the 2011-12 season - figures that keep the club inside Uefa's Financial Fair Play regulations and prevent too many questions being asked about an estimated debt that is close to 600m euros. They topped the latest Forbes football rich list and Perez sees the acquisition of Bale as a way of keeping them there. While Zinedine Zidane helped entice Bale to Real this summer, calling him Europe's most exciting player, it was Perez who identified the Welshman as the ideal vehicle for Real Madrid to break the world transfer record for the fifth consecutive time. 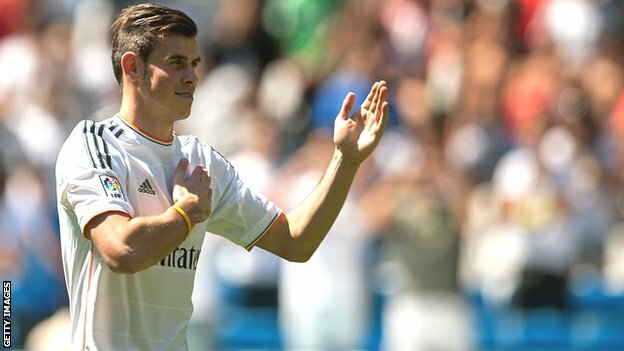 Having been told he was Real's target at the end of last season, supporters were chanting Bale's name at player presentations held earlier this summer, and although some have questioned the wisdom of buying someone whose position on the pitch looks well covered, most have just been swept away by the excitement. Bale's demolition of Inter Milan's Maicon in 2010 is as legendary down the Avenida Castellano as it is at White Hart Lane. That means in terms of the impact he will make - and with the eternal necessity to match Barcelona at the forefront of most Madrid supporters' minds - Bale is also the perfect response to Neymar on the pitch, as well as commercially. 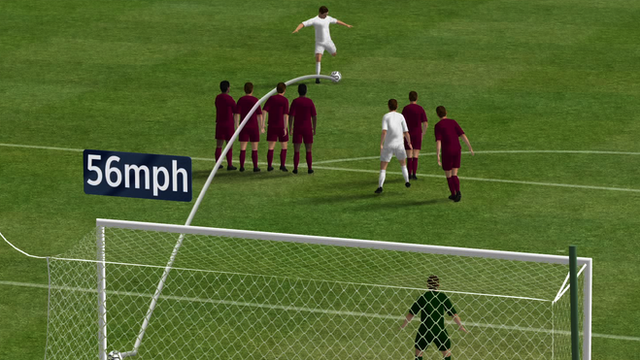 So will it work once he crosses the white line? Real have signed a player whose natural position is already taken by their star performer, Ronaldo, although that is nothing new because David Beckham joined a team that already had Luis Figo in 2003. At times on Real Madrid's summer tour of the United States Ronaldo was switched from his left-sided attacking berth, from where he has scored 200 goals in as many games, to a more central position - with mixed results. 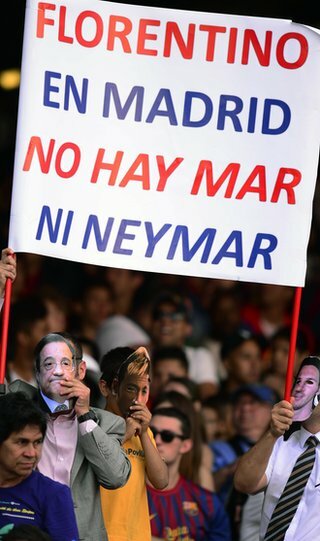 At Neymar's unveiling in Barcelona, the fans teased Real Madrid president Florentino Perez with a banner that read: "In Madrid, there is no sea, and no Neymar." Moving him to Lionel Messi's false nine position might at first appeal to the sense of competition he feels with Barcelona's four-time world player of the year, but how long before he misses the wide open spaces of the flank? If he moves back to his position of the last three seasons, where does that leave Bale? He could comfortably operate on the right or in the middle of a three behind the striker, but that would still leave Isco, Mesut Ozil (who now looks Arsenal-bound) and Angel Di Maria fighting over the remaining place in the side, should the latter two be retained. And when Bale and Ronaldo both feature how will it affect Madrid's desire under Ancelotti to play more of the measured style the Spanish call "pausa" this season? Supporters have demanded a more elaborate short-passing game with fewer lightning breaks - not really Ronaldo or Bale's style at all. Scouting reports on Bale prepared by Barcelona two years ago, when they considered signing him as a left-back, questioned his ability to play in the confined spaces he will now inevitably face, with almost every team that meets Real Madrid setting up with nine men behind the ball. Jose Mourinho, now back as manager at Chelsea, has admitted asking for Bale in his last season in charge at Madrid. "I don't know what tactical plan Ancelotti has in mind," he said of his successor's predicament. Bale would have been frighteningly effective playing the Portuguese's favoured counter-attacking football alongside Ronaldo - but Ancelotti's remit is to play differently and incorporate short-passing midfielders Asier Illaramendi and Isco. When asked about Bale, Ronaldo said: "I have my opinion but I am not going to make it public." The Portuguese is under pressure to sign an extension to his current contract, which runs out in two seasons' time - and he will know that when Real Madrid want to coerce a player to sign they often leave him out of the team. For now that is unthinkable. But would things change if Ronaldo goes on refusing to sign? However harmoniously things begin, the long-term futures of Ronaldo and Bale will be fascinating to follow, as will Madrid's. With the broad shoulders, square jaw, perfectly coiffed hair and scintillating show reel, Bale is the closest thing to Ronaldo in world football, right down to the shades and the backwards baseball cap - and now they are team-mates. We know it makes financial sense. The next nine months will go a long way to revealing if it will all add up on the pitch as well. D Lopez; Carvajal, Ramos, Varane, Marcelo; Illarramendi, Modric; Bale, Isco, Ronaldo; Benzema (with Ozil and Di Maria pushed out by the new man).